We are delighted to participate in this festival celebrating Kazuo Ohno's 101th birthday and Japan Society's 100th anniversary. 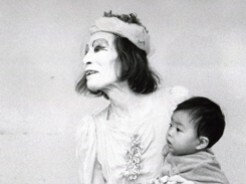 Koma and I met at Tatsumi Hijikata's studio in 1971 while studying and performing as company members. Soon after, we started weekly improvisation classes with Ohno sensei (Japanese form of address for teacher). Young and impatient, we left for Europe in 1973 to study and perform our own work. When we returned to Ohno sensei in 1975, it was only to leave for America again. To Ohno sensei, we were restless and unfocused students but he was always kind. He literally fed his students every week though none of us paid for his classes. Even after we moved to New York, he cooked, danced and taught us every time we visited each other. Though we have refrained from billing our work as Butoh, we have always felt that without Ohno sensei we would not be dancing. Ohno sensei is too amazing an artist for us to be aligned with, but his influence is deep and long-lasting. It is here at the Japan Society, at the invitation of Mrs. Beate Gordon (Japan Society's performance curator from 1958 to 1981), that we presented White Dance for our U.S. debut on May 6, 1976. The following year Beate invited us back to perform Fur Seal and helped us to remain in the US. In the fall of 1995, Paula Lawrence (performance curator of Japan Society from 1992 to 2003) produced our 20th anniversary season by commissioning Autumn Stories. For many years Japan Society has been not only our home but our inspiration. We saw more of Japanese performing arts and Japanese film at the Japan Society than we ever did in Japan.